Odiham resident Steve Brown is currently engaged in a herculean effort to cycle the Magna Carta Cycle Trail in just three weeks. In his possession is a specially commissioned Magna Carta Anthem, composed by Malcolm Archer, and published by The Royal School of Church Music on parchment. 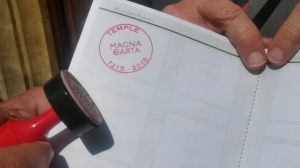 Steve arrived in London on Wednesday 6th August, and presented to the Temple Church a copy of the Magna Carta Anthem, which was received by Alice Pearson, the Magna Carta Project Manager for Middle & Inner Temple. A copy was also presented to Sir Robert Worcester, Chairman of the Magna Carta 800th Committee, and Mark Gill, Executive Director of the 800th Committee. Steve will return to Odiham on Saturday the 9th August, and will have completed a 1,100 mile trek through a trail famous for its historical significance in the reign of King John and the subsequent tensions that led to the signing of the Magna Carta in Runnymede.